(Macao, Nov. 22, 2018) – More than 180 employees from Sands Shoppes Macao retailers graduated from the Sands Retail Academy Thursday with a ceremony at the Four Seasons Hotel Macao, Cotai Strip. The group of retail employees work for over 50 well-known brands from various retail sectors, including fashion, watch and jewellery, general retail, and food and beverage. They are the seventh group to complete one of the complimentary customer service training programmes provided by the Sands Retail Academy. The academy seeks to support the retailers of Sands Shoppes Macao with service and management training for their employees. It is aimed at continually enhancing customers’ shopping experiences and strengthening the quality of service in Macao’s retail industry. Over 90 of Thursday’s graduates were recognised for completing the academy’s Service Enhancement customer service training programme, with another 90 or so having completed the academy’s Because We Care service culture training. The programme sessions were conducted between November 2017 and October 2018. Since the academy’s launch in November 2013, more than 8,000 retail employees have attended its programmes and workshops. The academy introduced a new Manager Competence Development programme in October, targeted at training retailers’ mid-level management staff. October also saw the launch of a new initiative exclusive to the Sands Retail Academy, the Celebrity Mentor Workshop Series. Co-organised by the Macao Government Tourism Office and Sands China Ltd., the training programme invites celebrity mentors to conduct customer service workshops for retail professionals, letting them learn from experts in their respective fields. Astrid Chan delivered the first workshop in the series, Creation of Personal Branding. The Hong Kong actress and UK-accredited trainer covered topics like how to build up a professional image, risk management, workplace etiquette, and communication skills. Motivational speaker Brian Cha is scheduled to facilitate his Sales and Consumer Behaviour workshop on Nov. 27. Sands China Ltd. launched the Sands Retail Academy in 2013 to offer complimentary training to retail professionals at Sands Shoppes Macao – the interconnected group of malls comprising Shoppes at Venetian, Shoppes at Four Seasons, Shoppes at Cotai Central, and Shoppes at Parisian, which together feature over 850 retailers. The Sands Retail Academy is the result of a collaborative effort between Sands Retail and Sands China’s human resources department. It is one of the initiatives of the Sands China Academy – a programme focused on the career development of both Sands China team members and local Macao talent, including those employed by Sands China’s retail partners. 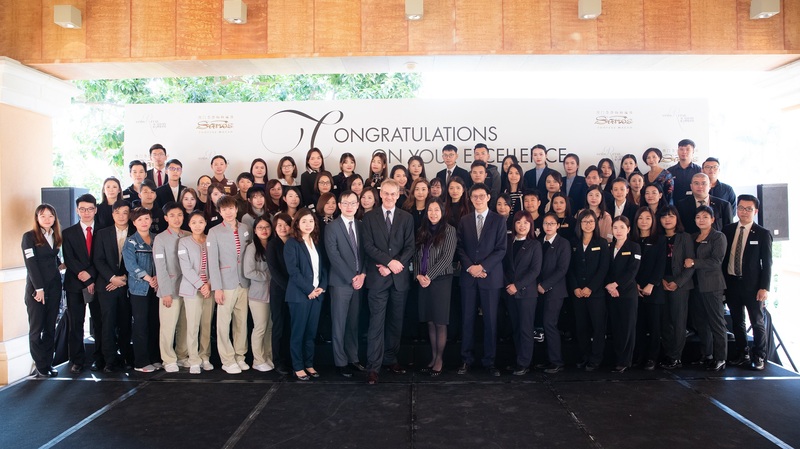 Photo caption: Graduates of the Sands Retail Academy attend a graduation ceremony Thursday at the Four Seasons Hotel Macao, Cotai Strip, with Sands China management in attendance.